I publish books so if you read this blog regularly you will hear about the books I publish but I also plan to highlight books in general that deserve some attention. People who read fascinate me so I will write about books, people who, like me, love to read, authors I find interesting and any other thing I darn-well please. 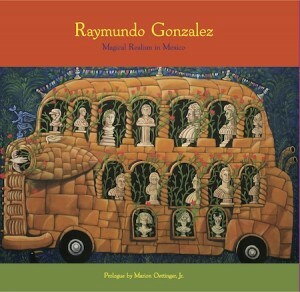 My first blog entry features my art book: Raymundo Gonzalez: Magical Realism in Mexico. I say “my” because it is published by Material Media, my publishing company, but that is not really accurate there were so many contributors to this book: designers, editors, essayists, photographers, and translators. Incidentally, the book just got a fabulous review from the Midwest Book Review – Raymundo Gonzalez: Magical Realism in Mexico. The review is reproduced on the Amazon listing. Interestingly, the cover designed by the beauteous and talented artist Andréa Caillouet wasn’t mentioned in the review. I love the cover with the hint of the Mexican flag and with the iconic bus. Her design came under some scrutiny recently by the experienced book cover experts at Publishing University Conference that I attended in Austin, Texas sponsored by the IBPA . The experts loved the colors and the painting but noted that the cover really didn’t tell you what was in the book if you didn’t know that Raymundo Gonzalez was a painter. Also, Magical Realism is mostly a literary term now. So how to correct that without reprinting all the dust jackets? A bookmark? Maybe? What do you think? Attach a sticker? I’m taking all suggestions.